I just received an email from USHPA regarding election statements from Region 3 USHPA Director candidates (including myself) and I wanted to pass this on to everyone here. Look for innovative ways to attract and maintain membership. Seek out more effective ways to minimize accidents and injuries. Consider ways to protect and develop current and future flying sites. While considering your selection of a regional director look for that one person who is willing to bring communities together and not divide them. Look for a leadership based on principles and not finger licking to see which way the political winds are blowing. And finally someone whose love and dedication is based upon the preservation and future of sports aviation. I hope to serve you for one more term and thank you! I would like to endorse Dave Jebb as Regional Director for Region 3 again this year. Dave has done an outstanding job for the members of region 3 over the years and I feel is the best candidate for the job. I have known Dave for over 15 years now, and he is not only an exceptionally nice person, he is fair, and trustworthy. His character is as flawless as his friendship to his fellow pilots. Dave is truly a born leader and I'm proud to have him lead Region 3 as USHPA Director again this year. I am asking the club members to support David Jebb for another year as USHPA's Region 3 Director because he has supported all of us over the years. 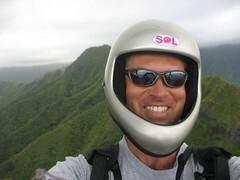 Dave has traveled to Hawaii many times to teach us Instructor courses, Tandem courses, and was a great friend of Jimmy's. He has worked very hard all these years to help us with site issues, rating issues, and he's been very accommodating to us when we traveled to Torrey. I believe that Bob K. is NOT in favor of paragliding best interests. I ask that you cast your vote in favor of David Jebb as 2009 USHPA region 3 director for another term. I need to know when we get our next issues of USHPA magazine? I contacted Mark Forbes (USHPA region 2 director) and he is in charge of mailings. He said that they may change the way they mail our magazines if we're getting them so late. Right now magazines are being sent 'Book Rate' (slow boat). Please post when you get your magazine. I got my magazine today (10/15/08), as did Rich - Jeff and Ray got theirs yesterday. David Jebb Rocks!! he is not only a safety minded person with great communication skills, he is one of the best instructors out there and shares a huge enthusiasm for the sport! I vote for David Jebb.